when we reached around 6.30pm! and my camera went into "action"
Oh yummy food!! I notice younger people like Japanese food and older people prefer Chinese food. Luckily I like both haha!! 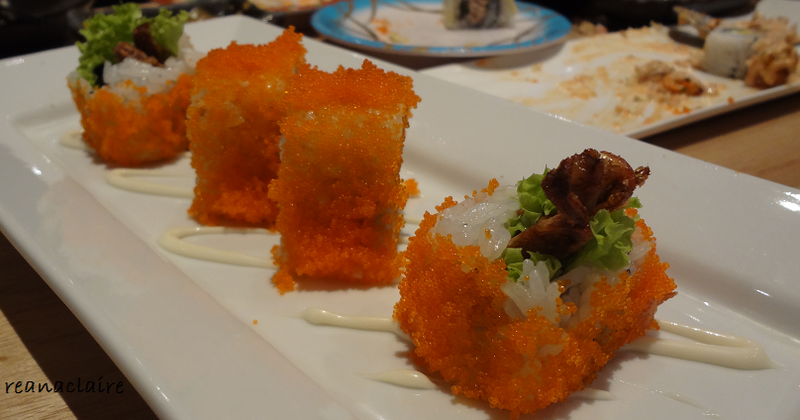 mecoy: all japanese dishes.. :) u like those too? Just love sushi. We eat it at least once a month. Ooooo...asparagus wrapped ion bacon. Yum! Yum! Yum! And that reminds me - Melissa's back for so long now and we have not dropped by the Zen here... No connection, I'm sure. filip: that's great.. hope you can post up in your blog too! New Japanese restaurant? The food looks delicious, how about the price? I can have Japanese food once a week (I would prefer alternate day), only if my pocket is loaded, hehehe! aiyoyo, the food looks very delicious!! no wonder your girl is never tired of going there again and again!! love the bacon and also that "pile" of orange-y things on the 3rd photo, what is that ah?? Wow, wow, so much varieties of Japanese food. My kids would love them heaps but not me. yay more food in Ipoh! irene: both of us same era ma.. hahaha..
cyn: wow.. so young she knows already? so clever! oh where is this Festival Walk? This restaurant is a hit in Ipoh now. My wife already went there for 4 times since last month. Was it expensive?? I am like you and won't be able to eat Japanese food so often.